Can healthy diet and lifestyle of father and mother prevent cardio-metabolic risk in the offspring? Cardiovascular diseases [CVDs]; hypertension, coronary artery disease [CAD] and stroke as well as diabetes may have a family history as a common risk factor which is often present in almost one quarter to one third of the patients [1,2]. Subjects with risky health behaviors; sedentary behavior, eating of Western-style foods, tobacco and alcohol intake, and stress-prone behavior may also have a family history of these behavior patterns [1-3]. Similarly, a family history of protective health behavior; e.g. eating functional foods, undertaking spare time physical activity and sports, consuming no tobacco and/or, and practicing regular active prayer or yoga and meditation, or going early to bed and early to rise may be observed, although it could be due to health education or parenting of the parents . In numerous studies, the genetic basis of alcoholism and tobacco addiction has been also observed but the genetic inheritance of other risky behaviors or healthy behavior is not clear . Since CVDs and type 2 diabetes develop due to risk factors, these problems can be prevented by more intensive management of risk factors and risky health behaviors . There is recent evidence that transgenerational inheritance of risk factors has also become important in the pathogenesis of premature CVDs and diabetes [6-8]. Risky health behaviors among mother and father can predispose epigenetic inheritance of related cardio-metabolic risk and associated diseases in the offspring. This indicates that the presence of healthy behaviors in the parents may have beneficial effects on the health of the offspring [7-9]. From this view point, it is proposed that changing the health behavior of mother and father before conception, can prevent epigenetic inheritance of cardio-metabolic risk in the offspring. There is evidence that gene-environment interactions are mediators for development of risk factors or protective factors to shape health and disease, involving epigenetic mechanisms [4,7-11]. Epigenetic gene regulation comprises the heritable changes in gene expression that occur in the absence of changes to the DNA sequence itself. Epigenetic mechanisms include chromatin folding and attachment to the nuclear matrix, packaging of DNA around nucleosomes, covalent modifications of histone tails [e.g. acetylation, methylation, phosphorylation], and DNA methylation [9-12]. The influence of regulatory small RNAs and micro RNAs on gene transcription is also increasingly recognized as a key mechanism of epigenetic gene regulation. A classic example of epigenetic inheritance from mother is the effects of nutrient deficiency [choline, betaine, folic acid, and vitamin B12] during pregnancy, predisposing metabolic syndrome in the offspring; viz. Agouti mouse with obesity and yellow fur [7,8,13]. It is clear that epigenetic inheritance, due to deficiency of certain nutrients, in pregnant mice was associated with hypomethylation of the Agouti gene. This finding poses the possibility that nutrient supplementation to pregnant women might substitute the ‘methyl group’ to repair the abnormal methylation of the Agouti gene and help in the prevention of obesity and metabolic syndrome . Removal of methyl group from the normally methylated Agouti gene by increased supplementation of some nutrients; choline, betaine, folic acid and vitamin B12 may be helpful in repairing the deficit, thus leading to normal methylation of the genes, resulting in decreased risk of obesity and diabetes. Experimental study in mice shows that maternal dietary genistein supplementation during gestation, at levels comparable with humans consuming high-soy diets, also shifted the coat color of heterozygous viable yellow agouti [A[vy/a]] offspring toward pseudo-agouti . This marked phenotypic change was significantly associated with increased methylation of six cytosine-guanine sites in a retrotransposon upstream of the transcription start site of the Agouti gene. The extent of this DNA methylation was similar in endodermal, mesodermal, and ectodermal tissues, indicating that genistein acts during early embryonic development. Moreover, this genistein-induced hypermethylation persisted into adulthood, decreasing ectopic Agouti expression and protecting offspring from obesity. It is the first evidence showing that in utero dietary genistein affects gene expression and alters susceptibility to obesity in adulthood by permanently altering the epigenome . Recent studies also suggest that nutrient deficiency during pregnancy can cause intra-uterine growth restriction, resulting in lower birth weight, whereas multiple micronutrient supplementation during pregnancy may be associated with significant reduction in lower birth weight [15-17]. Since lower birth weight is a potential risk factor of future CVDs and diabetes, it poses the possibility that functional food consumption and healthy lifestyle; no tobacco, no alcohol, moderate physical activity and regular active prayer among of both the parents,can prevent future risk of CVDs and other chronic diseases in the offspring. In mothers, cord blood leucocytes from 79 newborn subjects, hypomethylation at the IGF2 DMR was associated with paternal obesity. A persistent inverse association between DNA methylation in the offspring and paternal obesity [Linear regression model-β-coefficient was -5.28, P = 0.003] was also observed . The findings suggest an increase in DNA methylation at the IGF2 and H19 DMRs among newborns from obese mothers. However, a larger study is warranted to further explore the potential effects of maternal obesity or lifestyle on the offspring's epigenome. This study shows a pre-conceptional impact of paternal obesity on the reprogramming of imprint marks during spermatogenesis. Given the biological importance of imprinting fidelity, the study supports transgenerational effects of paternal obesity that may influence the future health of the offspring. Environmental factors such as diet, tobacco, alcoholism, pollutants, late night sleep, stress and sedentary behavior, do not promote genetic mutations or alterations in DNA sequence, but do have the capacity to alter the epigenome. There are only a few studies which have shown the effects of father’s risky health behavior from the paternal side to offspring [11-13]. These outcomes from parents indicate that our predisposition toward disease can be altered by what our parents or grandparents have done during key points of life during their development . Transgenerational inheritance has been defined as the ability of an environmental factor or toxicant to promote a phenotype or disease state not only in the individual exposed, but also in subsequent progeny for multiple generations. Most of the environmental exposures can influence somatic cells and not allow the transgenerational transmission of a phenotype. However, the ability of an environmental factor to reprogram the germline epigenome, such as a high fat diet can promote a transgenerational inheritance of phenotypes and disease states by a significant epigenetic reprogramming of the germline. In an experimental study, a chronic high-fat diet administered in fathers, programs β-cell dysfunction in female rat offspring and induces obesity-impaired glucose tolerance [IGT], insulin resistance among female offspring that worsened with time, relative to controls . This diet altered the expression of 642 pancreatic islet genes in adult female offspring that belonged to 13 functional clusters, including cation and ATP binding, cytoskeleton and intracellular transport . Further analysis of 2492 genes differentially expressed, demonstrated the involvement of Ca-MAPK and MnT signaling pathways, apoptosis and cell cycle. Hypomethylation of the Il13ra2 gene, showed the highest [1.76 fold] increase in expression for the first time in mammals . It is also shown for the first time that a non-genetic, intergenerational transmission of metabolic sequelae of a high fat diet from father to offspring has been observed in mammals [11-13]. It is possible that damages caused by high fat or saturated fat or a deficit of w-3 fatty acids and other micronutrients, at the level of the epigenetic component of the gene of the fathers, may explain these transgenerational effects of the paternal features [12,18]. It is proposed that during spermatogenesis or oogenesis, apart from environmental factors, reprogramming of methylation profiles can impact at imprinted genes, during or before conception by environmental factors, diet, activity, mental stress, tobacco, alcohol, pollutants resulting in physiological and metabolic alterations in the fertilized egg and later on in the offspring [19-21]. (Figure 1). Unhealthy diet and lifestyle and environment damages sperm and oocyte and inhibits fertilization and healthy diet may be protective. The function of human spermatozoa depends upon availability of progesterone release by cumulus cells surrounding the egg which attracts the spermatozoa towards the egg and helps them penetrate the egg’s protective vestments [19,20]. (Figure 2). Progesterone induces Ca2+ influx into spermatozoa and triggers multiple Ca2+-dependent physiological responses essential for successful fertilization. In this context, fatty acid and flavonoid content composition of the sperm’s flagellum and of the coating of the oocyte appear to be important to facilitate penetration of the sperm in the oocyte resulting in to fertilization . Figure 1. Unhealthy diet and lifestyle and environment damages sperm and oocyte and inhibits fertilization and healthy diet may be protective. Figure 2. Ova of female showing liberation of progesterone to attract the sperms during fertilization. Progesterone release by cumulus cells surrounding the egg attracts the spermatozoa towards the egg and helps them penetrate the egg’s protective vestments. Omega-3 fatty acids and flavonoids maintain the cell membrane integrity of egg and sperm. Experimental studies provide novel insights into the short- and long-term consequences of early stress and the role of cortisol in increasing adrenocortical activity on future health and on epigenetic inheritance of stress in the offspring . There may be both biphasic and unique age-dependent changes at the molecular, epigenetic, neurogenic, and behavioral levels. indicating that early stress may transiently endow animals with a potential adaptive advantage in stressful environments but also across a life span which may be associated with long-term adverse effects on cardio-metabolic risk due to alteration of epigenetic regulation of the hippocampal BDNF gene expression [22,23]. In a clinical study among 383 patients of CAD and 368 control subjects,the I164T mutation in the adiponectin gene was a common genetic background associated with the metabolic syndrome and CAD in the Japanese population . Telomere structure and function are related to epigenetic marks and may be altered by health behavior of both the parents. Telomere length is an indicator of biological aging and dysfunctionof telomeres is linked to age-related pathologies such as CVDs, Parkinson’s disease, Alzheimer’sdisease, and cancer [23-25]. Telomere length has also been shown to be positively associated with nutritional status in human and animal studies. In a cohort study, among the 608 patients with stable CAD, there was an inverse relationship between baseline blood levels of marine w-3 fatty acids and the rate of telomere shortening over 5 years . These findings raise the possibility that w-3 fatty acids may protect against cellular aging in patients with CAD. 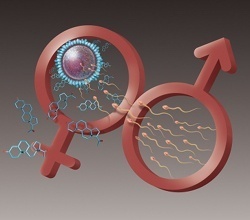 The concept ofcellular memory passed onto offspring may be mediated bythe character of the spermatozoon, its biochemistry and biology, and its interaction with environmental factors such as diet. It is possible that epigenetic inheritance may be the key to solving many unexplained phenomena in humans, related to health and behavior as well as to CVDs and other chronic diseases [26-28]. Mediterranean-style diet is rich in functional foods that are also rich in all the micronutrients; w-3 fatty acids and flavonoids, vitamins and minerals and low in saturated fat and w-6 fat and energy. In a primary prevention trial among approximately 7447 subjects, consumption of a Mediterranean-style diet with nuts or olive oil for 4.8 years was associated with significant decline in CVDs and diabetes in the two intervention groups compared to low fat diet group, respectively [events 83,96 vs 109] . It is possible that eating 400 g/day of fruits, vegetables and nuts and another 400 g/day of whole grains; beans, grams, peas, porridge of wheat and millets as well as chocolates and fish, by the father and mother, may cause repair of the epigenome resulting in healthy offspring. In brief, apart from diet and lifestyle factors, environmental stress, seasonal influences and pollutants can influence epigenetic variations, including changes in DNA methylation, histone modifications and microRNAs which may occur due to oxidative stress induced epigenetic damage [22,26,27]. Since unhealthy diet and lifestyle of the mother and father can predispose unhealthy offspring, it may be proposed that healthy diet and lifestyle of the parents can inhibit cardio-metabolic risk and produce a healthy offspring without a future risk of obesity, CVDs and diabetes. In view of this evidence, it is possible that increased intake of w-3 fatty acids, essential and nonessential amino acids, antioxidant vitamins, minerals, flavanols and genistein [rich in Mediterranean-style foods] avoiding environmental stress, by father and mother can have beneficial influence on health of the offspring. Conflict of interest has not been declared by the authors. Family history and cardiovascular disease (2016). World Heart Federation. The PURE Investigators (2013) Prevalence of a healthy lifestyle among individuals with cardiovascular disease in high-, middle- and low-income countries: The Prospective Urban Rural Epidemiology (PURE) Study. JAMA 309: 1613-1621. Eckel RH, Jakicic JM, Ard JD, de Jesus JM, Houston Miller N, et al. (2014) AHA/ACC guideline on lifestyle management to reduce cardiovascular risk: a report of the American College of Cardiology/American Heart Association Task Force on Practice Guidelines. Circulation 129: S76–S99. Marsh G (2010) Fat fathers affect daughters’ health. Nature. Keith P, West Jr KP, Shamim AA, Mehra S, Labrique AB, et al. (2014) Effect of maternal multiple micronutrient vs iron–folic acid supplementation on infant mortality and adverse birth outcomes in rural Bangladesh The JiVitA-3 Randomized Trial.JAMA 312:2649-2658. Fedacko J, Vargova V, Singh RB, De Meester F, Singh AK, et al. (2011) Can a high w-6/w-3 fatty acid ratio in the tissues predispose infertility? The Open Nutra Jour 4: 156-162. Fedacko J, Vargova V, Singh RB, De Meester, F Pella, et al. (2010) How nutrient and nutraceuticals modulate genetic expressions in cardiovascular diseases. In World Heart Research Yearbook. Nova Science Publishers, Inc., Hauppauge. Singh RB, Shastun S, Singh P, Tomar G (2016) Unhealthy diet and lifestyle of the donors of sperm and ovum predispose cardio-metabolic risk in the offspring. World Heart J. ©2016 Ram B Singh, This is an open-access article distributed under the terms of the Creative Commons Attribution License, which permits unrestricted use, distribution, and reproduction in any medium, provided the original author and source are credited.